This chapter re-examines the principles that underpin business process technologies to derive a novel approach that moves beyond the traditional assembly-line metaphor. Using a set of principles derived from activity theory, a system has been implemented, using a service oriented architecture, that provides support for dynamic and extensible flexibility, evolution and exception handling in business processes, based on accepted ideas of how people actually perform their work tasks. The resulting system, called the worklet service, makes available all of the benefits offered by process aware information systems to a wider range of organisational environments. Organisations are constantly seeking efficiency improvements for their business processes. To help achieve those goals, many are turning to Process-Aware Information Systems (PAIS) to configure and control those processes (Dumas et al., 2005; van der Aalst & van Hee, 2004) by supporting their modelling, analysis, enactment and management (zur Muehlen, 2004; Casati, 1998). The key benefits organisations seek by implementing PAIS solutions include: improved efficiency, better process control, improved customer service and business process improvement. The use of PAIS has grown by concentrating on modelling rigidly structured business processes that in turn derive well-defined workflow instances (Bider, 2005; Joeris, 1999; Reichert & Dadam, 1997). However, the proprietary process definition frameworks imposed make it difficult to support (i) dynamic evolution and adaptation (i.e. 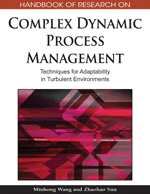 modifying process definitions during execution) following unexpected or developmental change in the business processes being modelled (Borgida & Murata, 1999); and (ii) deviations from the prescribed process model at runtime (Rinderle et al., 2004; Casati, 1998). But change is unavoidable in the modern workplace. To remain effective and competitive, organisations must continually adapt their business processes to manage the rapid changes demanded by the dynamic nature of the marketplace or service environment. Also, a large proportion of workplaces undertake activities that do not easily conform to rigid or constricting representations of their work practices. And even in the most concrete processes deviations will occur within almost every instantiation. If PAIS could be extended to meet the challenges of evolutionary and unexpected change in business processes, then their applicability would widen to include a far greater proportion of workplaces. Such support would not only benefit existing users of process-aware technologies, but would also introduce those businesses which employ more creative or ad-hoc processes to the range of benefits that PAIS offer. The presentation of an elaborated example. A business process can be defined as a composite set of tasks that comprise coordinated computer-based and human activities (Leymann, 2006). A business process model or schema is a formal representation of work procedures that controls the sequence of performed tasks and the allocation of resources to them (Oberweis, 2005). Service-Oriented Architecture: A software architecture consisting of a number of discrete (usually web-based) services (software components that are accessed or communicate via standard network protocols), that link together as required in order to achieve some task. Ripple-Down Rules (RDR): A hierarchical, extensible set of rules of the form “if condition then conclusion”, together with cornerstone case data, conceptually arranged in a binary tree structure. Exlet: An exception handling process, consisting of a number of exception handling primitives such as Suspend WorkItem, Remove Case, Compensate, and so on, which defines what action should be taken in the event of an exception of a certain type and context. Activity Theory: A meta-model or framework used to describe, theorise and research organised human activities, originating from Soviet cultural-historical psychology in the 1920’s. Worklet: A (usually) small, self-contained, complete process definition which is designed to be invoked as a substitute for one specific task in a larger, composite process. Each worklet is a complete extended workflow net (EWF-net) compliant with Definition 1 of the YAWL semantics. A set of zero or more worklets may form the repertoire of a task. Process-Aware Information System (PAIS): A software system that manages and executes operational processes involving people, applications, and/or information sources on the basis of process models (Dumas et al., 2005, 7).